Zhao, F., Mallorqui, J.J., Iglesias, R., Gili, J., Corominas, J. 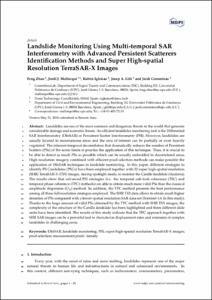 Landslide monitoring using multi-temporal SAR interferometry with advanced persistent scatterers identification methods and super high-spatial resolution terraSAR-X Images. "Remote sensing", 1 Juny 2018, vol. 10, núm. 6, p. 921-1-921-23.